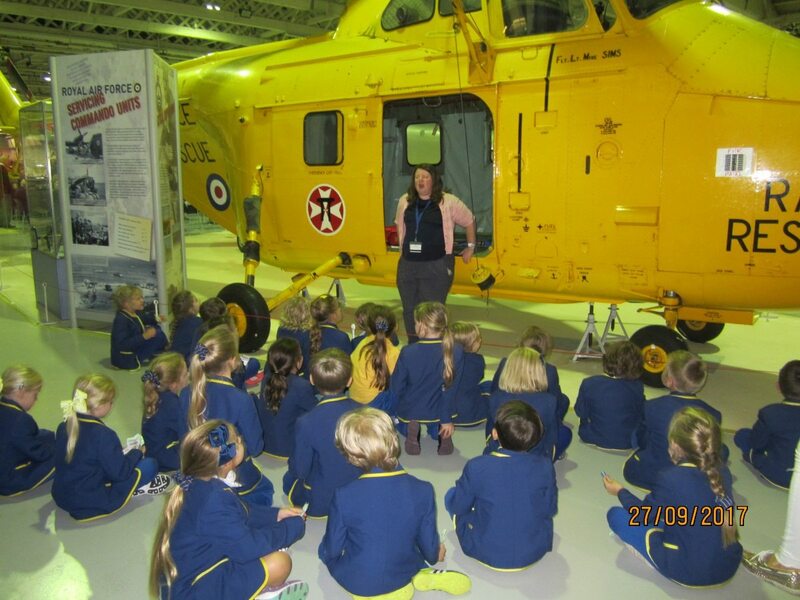 On Wednesday, Year 2 went to RAF Hendon (Luca P). It was a very long journey to get to RAF Hendon and the bus was very bumpy (Pandora). I sat next to Tia and we looked at the cars – they were so small. I called them mini cars! (Esme) We went in the massive building in RAF Hendon. It was magnificent! (Evie) The first thing we saw when we arrived was a shark aeroplane and when we walked more inside we saw more and more aeroplanes (Alexia). When we arrived a lady called Jo told us all about helicopters and how they fly. Sophie D and Isla H were very lucky as they got to go into a real helicopter and learn how to use the controls! (Darcey P) Jo was filled with cracking ideas! (Saffron) We made paper helicopter blades ready to test later. When we had finished we looked at lots of helicopters including a rescue helicopter. Henry M pretended to be stranded and Jo pretended to winch him into the helicopter. Did you know we still use these helicopters today? (Joel R) We looked at a big, bright yellow rescue helicopter. They made me volunteer. I wore a harness and sat in the helicopter (Henry). We saw a big helicopter that was red and was the Queen’s. We knew it was the Queen’s because it had the Queen’s crown on (Noah). After we went to a helicopter used for holidays and it was big (George). We also went into a Chinook helicopter. It was the largest object in the museum and very strong – it can carry a real tank! (Amber T). After that we dropped our paper and card blades from a very tall height to see which one was the best. It was the paper one (Luca P). The card one was the heaviest so it fell down the quickest. The paper ones were the lightest so they stayed in the air longer (Tia). Next we had lunch. I had a tuna sandwich and an apple and a sausage roll. For pudding I had chocolate cake (Josie). The lunch was very yummy! (Florence) Next we went into another building and looked at a yellow board which had Leonardo da Vinci’s flying machines on (Mya). We saw my great grandad’s army plane – the Lancaster Bomber (Matilda). I went to bed dreaming of Hendon (Elliot).